How do you smoke on a gas grill? My normal advice: don’t. Gas grills work well for direct grilling, indirect grilling, and spit-roasting, but most do a poor job with smoking. The problem is the wide venting in the back of most gas grills, which allows the smoke to escape before it has a chance to flavor the food. Gas grills simply don’t give you the crusty bark, crimson smoke ring, and rich smoke flavor characteristic of meats smoked on a wood- or charcoal-burning smoker. However, there are some devices and techniques that will give you a partial smoke flavor on a gas grill. Built-in smoker box: Many higher-end gas grills come with a smoker box, a metal tray with a perforated lid and a dedicated gas burner beneath it to heat the wood to smoldering. You fill the box with wood chips or pellets and light the burner. The smoke emerges from the holes in the lid and, in theory at least, gives your food a mild smoke flavor. Freestanding smoker box: Works like a built-in smoker box, but you position it on the grate over one of the burners. Again, the smoke flavor is mild. 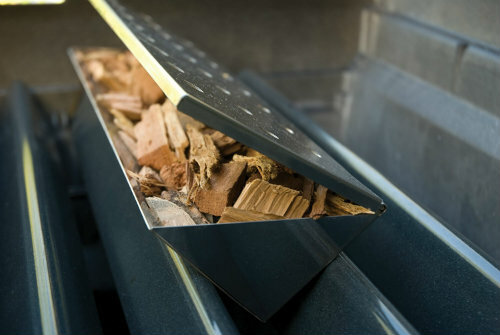 Wood chunks under the grate: This is one of the simplest and most effective ways to smoke on a gas grill. Remove the grate and lodge a half dozen or so wood chunks between the heat diffuser bars (Flavorizer Bars if using a Weber grill) or on the ceramic briquettes. 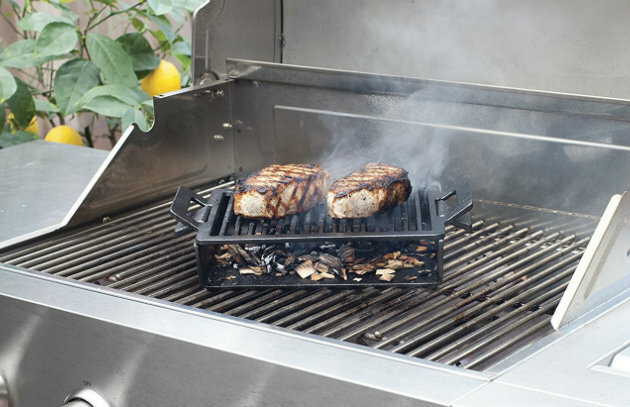 Once you see wisps of smoke, position the food on the grate over the wood. Under-grate smokers: Available in reusable metal or disposable aluminum foil, these V-shaped smoker boxes and cups hold wood chips, sawdust, or pellets and fit between the heat diffuser bars of your gas grill. Because you position them directly under the food, you get a more pronounced smoke flavor than with a smoker box off to the side. Aluminum foil smoker pouch: Wrap 2 cups wood chips in a large sheet of heavy-duty aluminum foil to make a pillow-shaped pouch. Poke a series of holes in the top and you get a smoker pouch. Position it under the grate directly over one of the burners. Place a second pouch at the opposite end of the grill. Run the grill on high until you see smoke, then reduce the heat to the desired temperature. 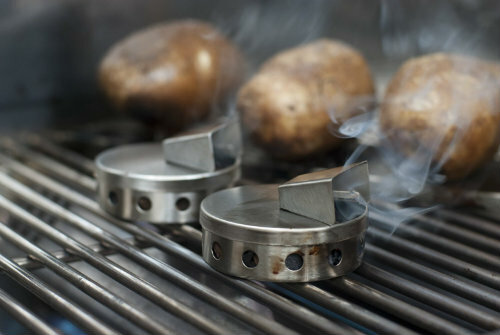 Over-grate smokers: These are smokers you place directly on the grill grate. Some are metal mesh pouches or perforated tubes you fill with wood pellets. Others are shallow metal trays you fill with wood chips.